For the last few days I've been suffering from a pretty bad almost-cold. It hasn't developed fully into a cold yet, but it's been just annoying enough that I need to clear my throat and blow my nose constantly. I'd planned on tonight being the grand tasting of the amazing Christmas gift that Jen got me: Westvleteren XII, a beer I've been trying to get my hands on for years. While my smell and taste don't seem all that affected by the cold, I figured I'd wait until I was back up to 100% for the tasting. Besides, Jen's tooth pain has taken a turn for the worse so I figured it would be best for all of us this way. We had a good, though exhausting, day with the babies. Jen, suffering from pounding head and tooth pain, pleaded with me in a vulnerable moment to watch the Golden Globes. Awards shows of all sorts are something I hold to be one of the worst things about humanity. However, given her condition and the look of desperation in her eye I easily accepted her humble request. Making dinner in the past few weeks has been extremely challenging. 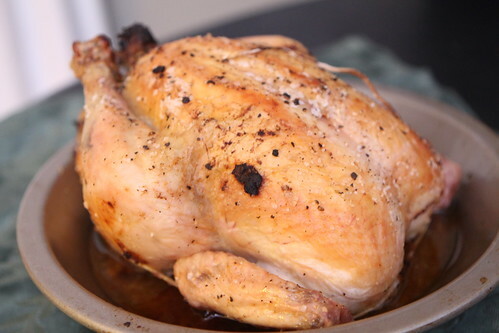 Even given the entire day to prepare, the best I could come up with for dinner was this: I stuffed a nice little chicken with some leftover meat stuffing my mother brought for Christmas dinner. It's an old family recipe but I've never had it stuffed in a bird before. It was actually very delicious but the preparation time excluding the time in the oven was about five minutes and it was a struggle to get it done. 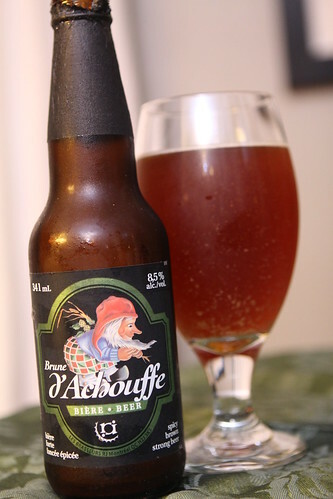 For beer I opened this Brune D'Achouffe from Brasseurs R.J. in Montreal, another gift from Jen's father. I think this is the equivalent of the Belgian McChouffe brewed under contract in Montreal. I would not be able to tell that this was the North American version of a Beglian beer. It had all the hallmarks of a Belgian beer, right down to the giant chunks of yeast sediment. It was so chunky, actually, that I passed it through a coffee filter since I was giving some to Jen after her dental surgery and I was worried the yeast might affect her teeth somehow. I'm not basing this on any sort of science, just a strange, idiotic intuition I had. Martin, as per usual, would not go to sleep. After ten or twenty minutes of screaming we took him out into the living room where it was clear that he, too, just wanted to watch the Golden Globes. We both took turns fighting with him to get him to not watch the Golden Globes but no matter what we did, he would find a way to contort his body in some way to watch. We then tried putting him in his activity gym and covering it with a blanket so he couldn't watch. Then he started laughing maniacally for a while. After returning him to bed he screamed and screamed and screamed until finally we relented. We didn't fight it anymore. We just propped him up on the couch, turned up the volume and told him to enjoy the friggin' Golden Globes. Enjoy, my strange little man. Enjoy.